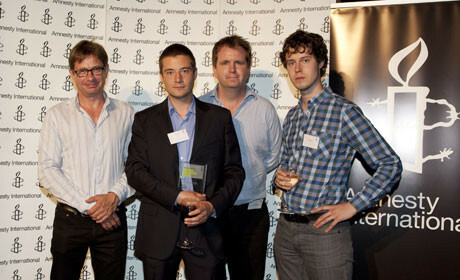 The Bureau of Investigative Journalism has won the Amnesty International digital media award for the second year running. Dan Bell, Iain Overton, Stuart Griffiths, Charlie Mole, Rachel Oldroyd and Angus Stickler from the Bureau, a not for profit based at City University, won the accolade for Deaths in Custody: A Case to Answer. The awards, which took place last night, saw Sunday Times journalist Marie Colvin win a posthumous award for her reporting from Syria, where she was killed in February. The ceremony included a special video tribute message from Marie Colvin's mother. Awards, which "recognise excellence in human rights reporting and acknowledge journalism’s significant contribution to the public’s awareness and understanding of human rights issues", also went to Channel 4/ITN Productions, BBC Newsnight, Al Jazeera and ITV London/ITN.